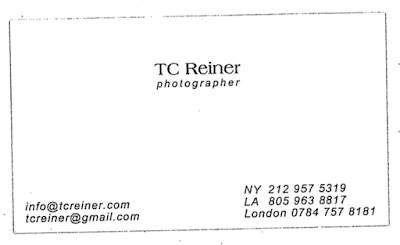 “TC Reiner” is a fictitious name. Fraud and deception does not end with a name. Schmegner is based in Santa Barbara, California. Yet no "TC Reiner" corporate entity is listed with California’s Secretary of State in Sacramento. 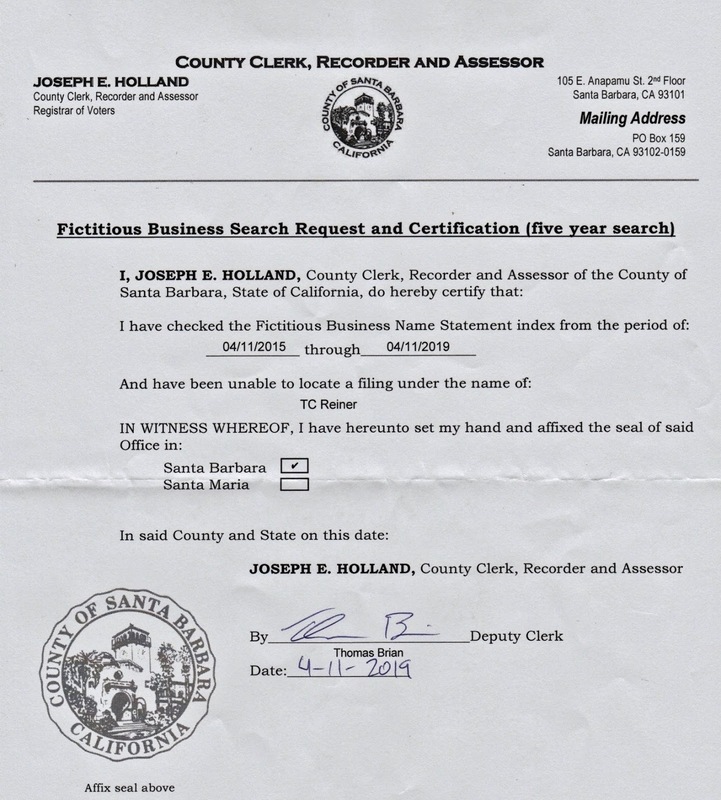 And no DBA under the name "TC Reiner" is registered with the Clerk-Recorder Office in Santa Barbara County. 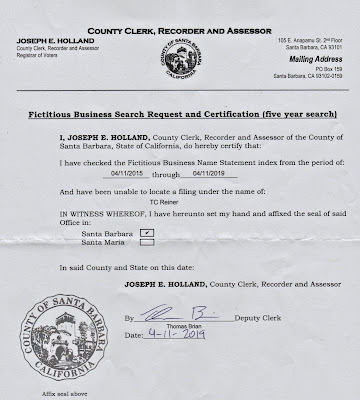 Doing business under a fictitious name is improper, unless registered, under California law. 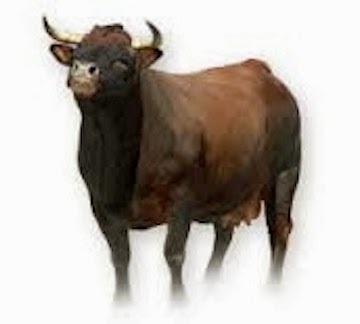 Hence: If you happen to meet "TC Reiner," my advice is… RUN! 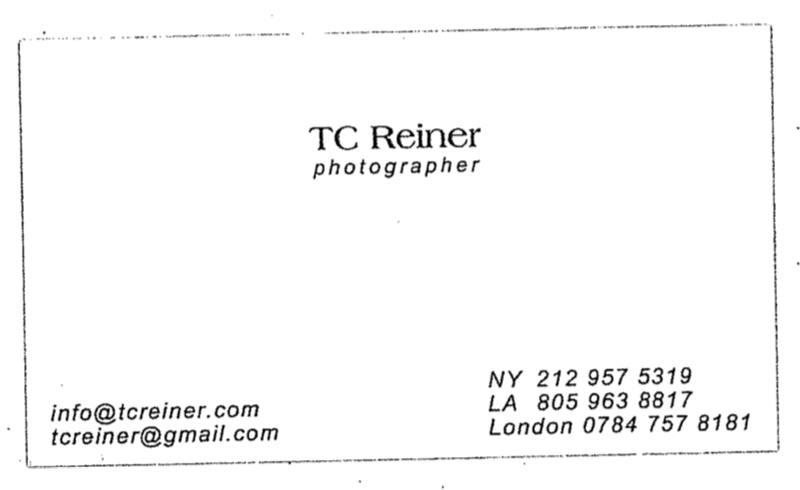 And if "TC Reiner" offers to take your photograph, even as a gift, I recommend… RUN FASTER!! Because Schmegner, operating under an unregistered fictitious name, seems to use photography as a way to set people up for a shakedown. 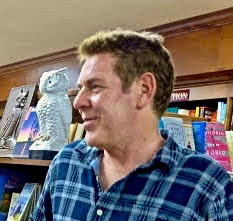 Then, without your permission or knowledge, Schmegner registers your image as his copyright or argues that it is automatically copyrighted by law. You didn’t sign a contract for receiving a gift, right? But now that you, or someone else, posts the photograph on social media, it is claimed to be a violation of archaic copyright law. Schmegner allegedly knows all about copyright law. If you don’t pay thousands of dollars to make it go away, get ready for a lawsuit against you. Schmegner has a track-record of filing such lawsuits. Google TC Reiner lawsuits and see for yourself.